CharyJay.com: The 30 Day Beauty & Body Detox - Join Me!!! WOAH! That was my reaction when I saw the support coming through via Instagram and Facebook once I posted the photo above. As some of you may know, I intended on doing this detox all by my lonesome, but my friend Danielle changed that the minute she texted me and said she was joining in and suggested I'd get others to do it too. Maybe it's weird, but I never thought that anyone would want to do it with me, but I'm really excited that so many are. It just makes the challenge so much more intriguing knowing other women are serious about their health on the inside and out. It really is inspiring. So a lot of people are asking me what the rules are. Uh, I'm not the one to tell you that lol. All I have to say is this is a Beauty AND BODY Detox. However far you'd like to go is fine. For example, Danielle is doing the detox by eating clean, but she's still going to wear makeup as she's required to do so for her job. If you want to focus on shedding some pounds by juicing (body) and only use organic soap (body) for 30 days that's fine too. It's totally up to you! Why would I impose some kind of rule on everyone for 30 days? Who's going to take orders from someone else when it pertains to their body? Certainly not I so I wouldn't do it the same to you. We're all grown and we can do what we want...at least that's what Beyonce said. *kidding of course. * I just ask that whatever you choose to do, let it fall in both categories: Beauty AND Body. 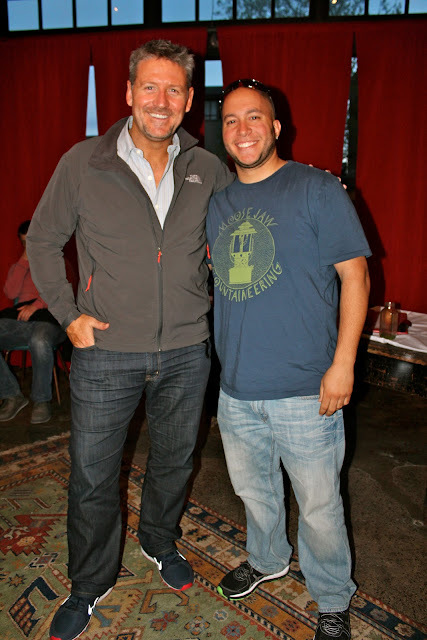 I originally wanted to just eat clean and juice periodically for my body detox, however that all changed once Derek and I went to hear Joe Cross of Fat, Sick and Nearly Dead, speak at Rodin in Detroit. I watched the movie via Netflix a few months ago so I didn't think I was going to learn much more from him, but I was wrong. Turns out if you juice for a number of days and then start eating (even if it's a salad or fruit) your body changes from thinking it's in famine mode and goes back to being hungry because you're chewing food. The result is you eat more that usual. During Q&A a woman mentioned she'd been juicing and eating, but wasn't losing as much weight as others who were only juicing alone. He said the body kept being confused since she'd juice for a number of days and then eat. There is a way you can do both, but you have to follow a certain formula that can be found on his website. This changed the game for me. I decided I just wanted to juice. This wasn't the only reason though. He mentioned he released so much waste that was in his body. Some of the stuff was on the verge of TMI so I won't repeat it (you're not going to blame me for the vomit on your keyboard), but it was just mind blowing. It made me wonder how much waste was inside of me and I immediately began to feel disgusted. That honestly was when I decided to do the 30 day reboot. I already have a Breville chillin' at the crib anyway. It'd be nice to put that thing to good use. As far as my body detox goes, the same rules apply. I'll only be using products with all natural ingredients and that includes fragrances. Did you know they fragrance/parfum could contain up to 200 chemicals? No bueno. I'll also be doing my hair in protective styles during this time. My hair just needs a break so I'm bowing down to it for 30 days. Because I know I can, I'm also going to workout each day during the 30 days. Yes, I know rest days are important, but I've read you can do cardio each day so even if I choose not to lift a dumb bell, I still can get up on that treadmill and break a sweat. I'll still do product reviews and styling tutorials on YouTube during this time. The only difference is everything I'll be reviewing will be all natural and fragrance free. The styling tutorials will be of protective styles only. I'll also share a few juicing recipes on YouTube and come with a weekly video updates on how everything is going. I'll post most of my experience on the blog as it simply is easier for me to document how I'm doing in a timely and proficient manner. If you're up to put your mind and body to the challenge, simply leave a comment below and tell me what changes you plan to make in your lifestyle for the next 30 days. Also, if possible, take pictures of your before so you'll have great after shots. Keep these for yourself, but of you're in the sharing mood, I'd love to share them on the blog at the end. Of course I'll post my own as well. I'll have weekly giveaways on my blog and social media platforms of Eco-friendly hair and beauty products that I love. As of yesterday I said this was all coming out of my pocket unless someone wanted to sponsor a giveaway and what do you know showed up in my email this morning? But regardless, everything I giveaway I would have used myself and can attest to the awesomeness of the product. If you have any comments or concerns please let me know. I'm excited that so many of you are up for the challenge! Yes it will be hard, but remember we are all in this together! 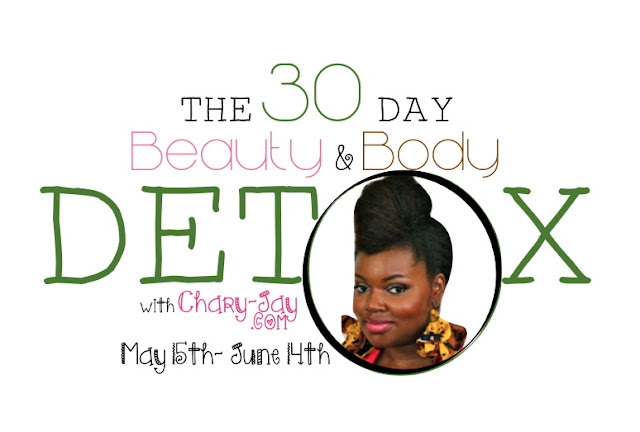 If you're posting via Instagram, please include the hash tag #CharyJay30DayDetox so people can see what you're doing for daily encouragement. It's important that people not just look at me to see what I'm doing, but we can all rely on each other for incite or advice by sharing our own experience. I'm so ready!!! Are you? This is great! Good luck! I won't be able to join right now, but I'm planning on doing a juice diet at end of the month! I'm so in. This is the very thing I need to get out of my lazy spell. Thanks again for doing this. I will post my juice in a few. I started a juice fast a few months ago but then I fell off the wagon so I'm going to try this with you all and see if I can go 30 days. I fell in love with HeyFranny and I've been doing a lot of her all natural and organic body care recipes for some time now. Look her up it may help you as well. Good luck everyone. I decided to juice a few days ago and saw that you were doing a challenge. Great timing! I plan on strictly juicing for 30 days. Haven't done much research on the soap yet but I plan on looking into it. I'm just excited that I'll be joining a group of women who are doing this as well. I pray that I can do this for 30 days! Whew! But Good Luck y'all!!! Very interested! had a baby 7 months ago and want to reboot my body as well as get rid of the extra pounds. I'm right there with you. I have been juicing on occasion but this is the push that I need to get serious about it. I'll be documenting my experiences on my blog if you are interested! I want to....but when does it start??? I'm in! I'm eating clean and walking daily. That's it. I will juice 3 days a weeks ( I am a diabetic and fruit has a lot of natural sugar but fruit is needed to balance out the veggies), eat clean, and workout everyday. Good luck everyone. Well Last month Month me and my sister started doing something like this and This past monday started our new month. my plan was to give up fast food... i live out of my car(not literally) and i'm paying the price... so i decided fast food had to go! So i guess starting today I'll just add to this and workout every morning and walk every evening! So yeah count me in! I plan on working on my pudge that I have currently for a stomach. Also i will be juicing and eating more plus incorporating as much cardio in this equation as possible. I know my body has consumed a lot of toxins so I am ready for a new body and a new rhythm. I'm in. My goal is to workout 3-4 time a week, juice and incorporate lots a fruits and veggies. One other thing drink lots of water (i have a hard time drinking water). Eating only lean meats and whole grains. This challenge was right on time. My plan is to eat clean and juice for 30 days. I am already a gym rat working out 4-5 times a week so my workout routine will not change.`Tenika M.
I can't always afford to get my own groceries but I am going to try to eat more fruit and veggies each day. Thanks for doing this!!! It motivates me. I am ready to detox. I wear makeup for work so when I am off I will be makeup free. I plan to drink a green smoothie daily; (easy because I do this already). I want to get more juicing into my diet with the advice via the link you provided. I will either wear my hair in protective styles and look into finding a new form of exercise that I have not attempted. I'll join you. I'm going to eat clean for the next 30 days. My goal is to work out 5 times a week, eat dinner at home at least 4 nights a week, and eat no more than 1800 cal/day for 5 days out of the week. I'm a college student and I'm always eating the wrong foods :( I have started to make my own green smoothies which are really good! I plan to keep it up, eat well, and also exercise. I will join you! Im totally in. Better late than never. Only juicing and one hour of cardio every day. I'm in! I have been saying for the past six months I needed a change. My body has become so flabby and I have become so lazy since starting my desk job. I will eat clean and start exercising 4x a week. My hair is in sisterlocks so I don't use anything but water on it. Thanks for the encouragement ladies. I would like to join. I am so sedentary and really need to get back to working out. I plan to workout 3 days/wk for an hour. I also plan to use all natural body cleansers and moisturizers. I have even decided to use natural deodorant which I have wanted to change to for awhile. Unfortunately, I am unable to do juicing now, but look forward to doing it in the near future. Best wishes on everyone's detox! I'll join. I plan on working out everyday Mon-Fri for an hour and a half. Eating more healthy foods, and try to replace at least one meal a day with a Green Smoothie.